We've added new items to this kit and kept the price low -- a better value than ever. 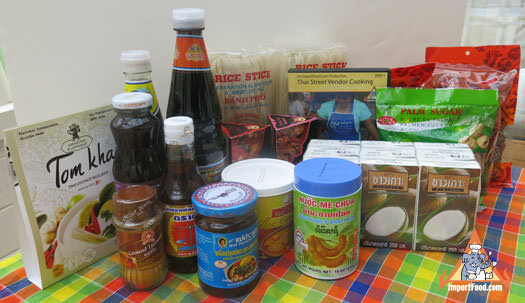 The Thai Restaurant Kit saves money for those who want to make healthy, complete Thai curry and noodle dishes at home rather than pay at the local restaurant. Using this kit, per-recipe cost will be under $2, and made at home it will taste even better with our top quality ingredients. You'll be able to make about 30 total servings of the recipes below, and other Thai recipes. You'll have ingredients to spare as well. Our Thai Restaurant Kit includes all of the ingredients below, together with your own meat and preferred fresh vegetables, this kit will allow the home chef to create over 30 servings of delicious Thai food, and have many ingredients left over. The flavor of yellow curry paste is not much different than red or green, however we've recently discovered how much we like yellow curry. Yellow curry makes vegetables taste great in our opinion, and we've been eating more vegetables and less meat these days. Here is a basic Thai yellow curry with chicken and potato. It's also good with bell pepper, butternut squash, or any seasonal vegetable of your choice. Serve a generous portion and watch it disappear. Here is an authentic Thai recipe using bamboo. If you want, slice your bamboo into little matchsticks, as is common in Thai restaurants in America. Usually in Thailand the dish will be made with the sliced bamboo sold by ImportFood.com, not cut into smaller matchsticks. For a similar recipe see: Kaeng Kua Sour Bamboo Shoot with Shrimp. The result of this recipe is a hot, spicy, thoroughly addictive succulent noodle dish. It might seem like you're adding too much ground chile peppers, but it's meant to be hot, and the chile gives it the distinctive color. This version is both sweet and spicy. To add some depth, you can add a tablespoon of tamarind concentrate to the cup of water. Use any greens you have on hand, we liked the way our version turn out, with bean sprouts and bok choy. This panang creates a large amount of meat and soup, would be great for potluck. We recommend using large chicken breasts with the bone still on. Panang Oak Gai means 'Panang Breast (oak) of Chicken (gai)'. This recipe is positively delicious, the final result has such a wonderful aroma, texture and flavor. See pictures below. This is a noodle dish, prepared in a rich creamy curry sauce, that is traditional in Northern Thailand. A popular lunchtime meal in northern Thailand. The flavor is not only distinctly "Thai" but it also goes very well with the American palate. We also offer a ready-made Kao Soi paste for quick preparation. Try to use fresh egg noodles. We found flat, fresh egg noodles at our local Safeway supermarket in the refrigerated section. Khao Soi is typically a rich gravy poured over soft noodles, then topped with the same noodles but crispy. This is a southern-style bbq chicken that's rich in spices, note the use of cumin and cinnamon which gives it a Thai/Malay style. The paste sticks well to the chicken and provides great flavor, so there is no need to serve this with a dipping sauce. It can be marinaded overnight or for just an hour or two.